I lost a naked e2 sage, the scs lived and held the field. please let me know if there is anything you think I should change, or send away, or make, or etc. They are trying to preach me to death, my capital took heavy dominion damage this turn. This turn I am declaring a prophet, and having two h2 priests preach despite it probably having no effect(updates since I sent out the tenative .2h)... I might need to come up with a plan to raid pythium temples to stay alive. If van still has his foldhold maybe he can remove a few temples near where his foothold is located... after this turn, and the following turn... I will have researched phx pyre and perhaps could devote more priests to pointlessly preaching in my capital despite my capital having too high a dominion for it to take effect (as a stopgap stay alive measure)... if someone is an expert dominion calculator and they feel that I need to convert all my priests to preaching this turn or next turn before learning alt7 feel free to let me know, and I will. Well I got 50-round routed in my battle at the fort, which was too bad because his largest squad had just routed and if they had made it off the field I would have been home free. I'm summoning up an angel of fury. Plans for the fort are undecided, but nearest I can tell, he can't touch my harbingers, so there's no reason not to send them in for another go. The question is should I gateway in troops (I can send in 250). Machaka is buffing his army with Arrow Fend and 50% FR, so even flaming arrowed troops backed by prison of fire won't have a great effect. My next research goal is fire storm to deal with this issue. DrP, please forge me a Hydra Skin Armor. Did someone make the Amulet of MR and Luck Pendant? If not, I'll need one of each as well. I need about 4bracers of protection plus the one I already have plus the one I am forging this turn to match up with the 3brands I have in my lab unequipped this turn. Is anyone forging me anything this turn or sending me anything this turn? I still have units worthy of gearing left. I tried some risky gambits in the west against Ulm and against Pangaea. The battle against Ulm went very poorly - I would've needed twice as many evocers as I had to make that work. Battle against Pangaea was a loss, but I didn't have much there and my mages survived. Making a gate cleaver, have 4 unassigned hammers, a chain of displacement, two starshine skullcaps and a winged shoes if people want stuff forged/sent. My pretender got back and was promptly killed by Maker of Ruins, so lets let him rest now. 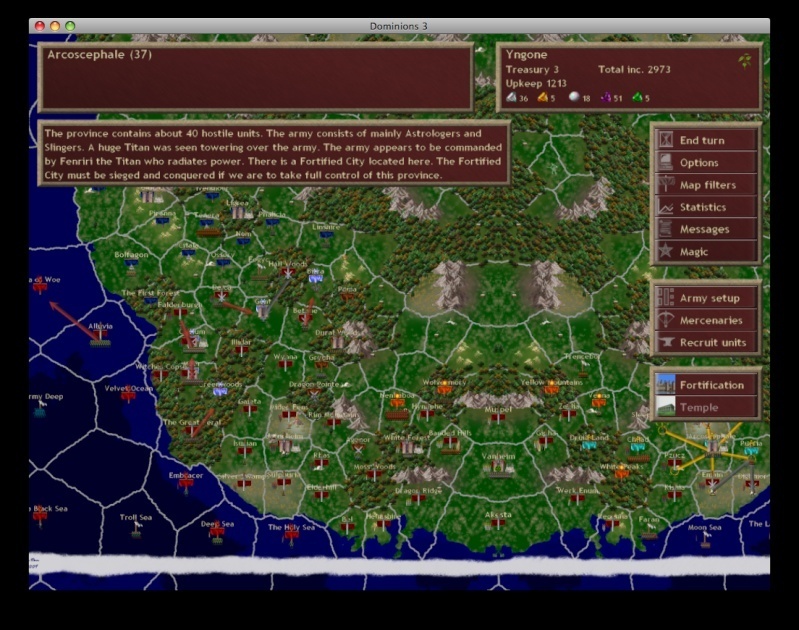 Caelum's twin forts are under siege, I'll concentrate troops on his capital so they'll just sit there kingdom come. Jotunheim did some small raiding, I'll try to steer clear of Marignon's troops so after TheDemon tells where that army at 52 goes I'll plot my way around it. Pythium's moving in to take provinces I raided, next turn he'll take an empty one, after that the one with a lab. I probably try to catch him with his pants down by gatewaying in at the last moment. Got the first seas from Abysia, moving on and recruiting second UW party. I've got some offensive capability laying around. DrP asked for a strike against Abysia Pangaea, if there aren't other suggestions I might take it. I've got some A4 and A3 mages, as well as two teleporters able to do Summon EP - Gifts routine. They should be able to hit some location, build a lab and start getting troops in. Also, two turns to Fog Warriors. Also how do you have so many hammers? I don't recall sending you that many? did i just lose count? after re-examining the scouting reports i'm worried pythium will try sieging from two directions again... jamming my movement north... shinyuma i know is more capable of winning but pythium still has more troop#'s in position it seems... hrmm dilema! i have a burning pearl i got from indies i will probably never use, anyone need it? 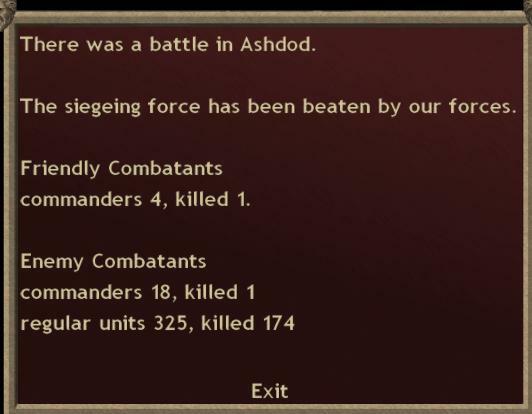 I think you saw this in IRC atul, but I'm attacking 54 on the Jotunheim front. I'll let you clean up the southern forces, and see if I can get a siege on Jotunheim's fort.